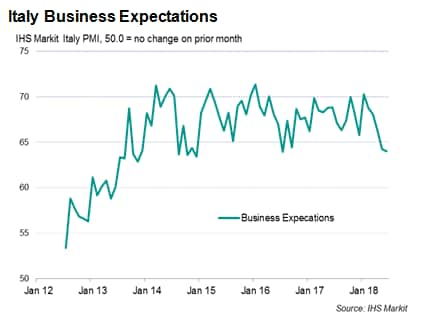 Latest Italian PMI data indicated an improvement in business activity growth during June. With capacity remaining under pressure, firms also continued to create new jobs. 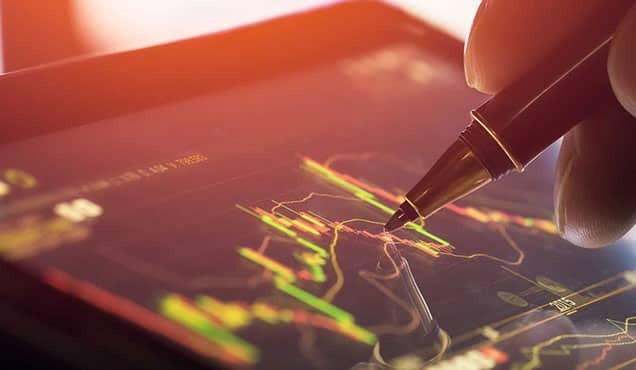 Nonetheless, the survey data remain indicative of only modest economic growth, and risks to future expansion remain skewed to the downside: political instability and worries over tighter credit conditions pushed confidence down to a near two-year low, whilst higher commodity prices again drove up firms' operating expenses. 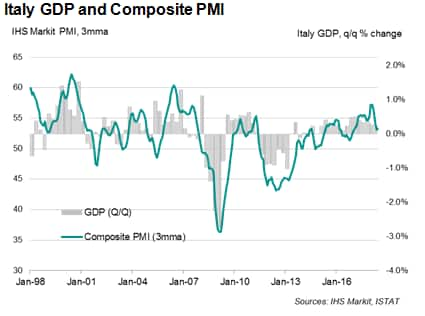 The IHS Markit Italy Composite PMI strengthened to 53.9 in June, from 52.9 in May. 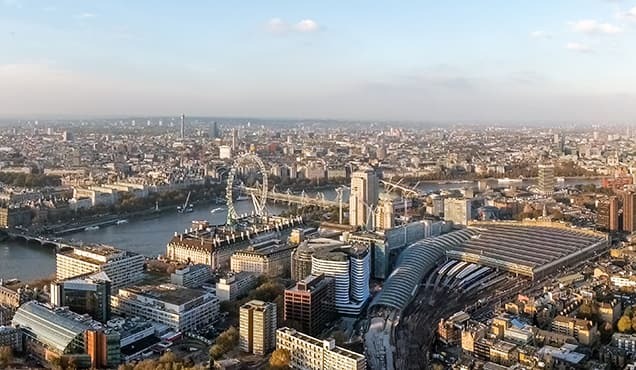 Whilst signalling the first improvement in growth since reaching its strongest level in over eleven-and-a-half years during January, for the second quarter as a whole, the PMI average was the lowest since the final quarter of 2016. 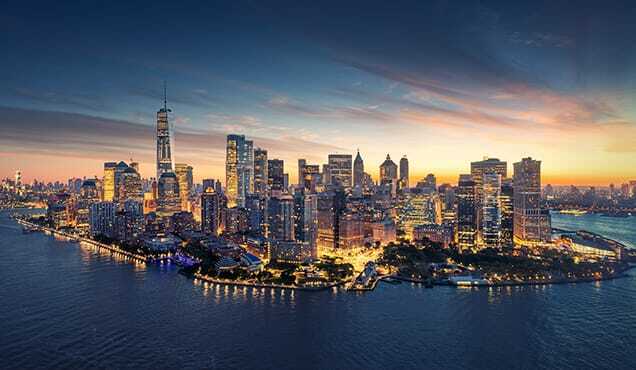 As such, the data suggest that the economy expanded a little over 0.1% in the three months to June. At least some of the weakness can be explained by supply side issues: growth rates in both output and new work remain above historical averages and sufficiently strong to generate capacity pressures. June's survey showed backlogs of work rising at the fastest rate since February, with the increase in services alone the strongest in over eight years. Such capacity issues continue to have a positive impact on labour market conditions, with companies reporting insufficient staff numbers to deal with current workloads. Aggregate employment subsequently rose in June to maintain a near three-year run of growth. By sector, June's upturn was led by the service sector, which posted its strongest expansion since February. 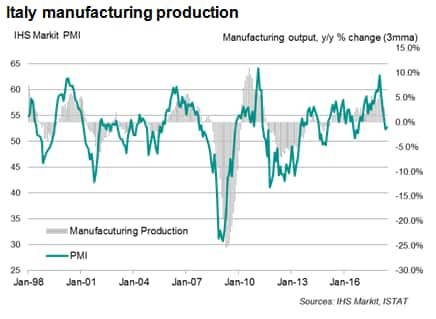 Manufacturing registered a slight acceleration in growth, but here the rate of expansion remains considerably below that seen at the start of the year. 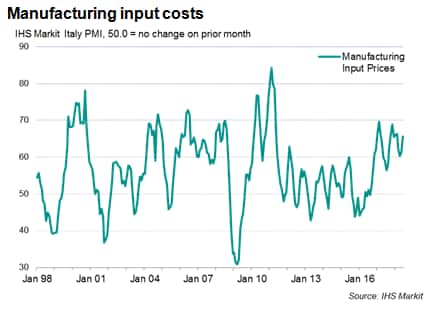 Indeed, back in January, manufacturing output had risen at the second strongest rate in the survey history, but growth subsequently tumbled into early summer as supply side constraints mounted and the principal driver of the expansion - strong external demand for high-end Italian manufacturing goods - waned in line with the broader downturn of the global trade cycle. 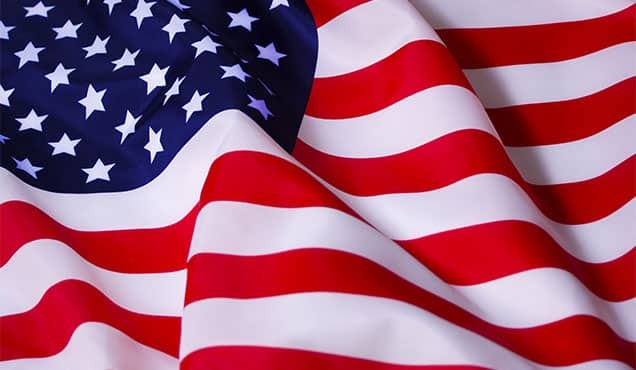 The June surveys also indicate that political instability and concerns over tighter financial conditions are weighing on business confidence. Expectations about output in the year ahead softened in June to their lowest level in just less than two years (and were amongst the weakest since 2013), and subsequently suggest that growth will remain subdued in the second half of 2018. Amid global trade protectionism tensions, manufacturing likely remains especially vulnerable to a further slowdown in the second half of the year. 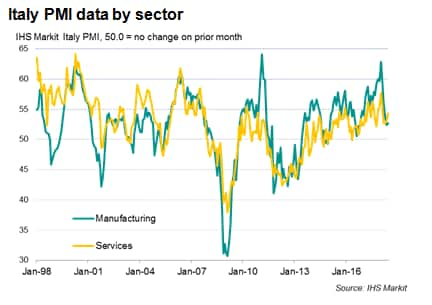 PMI data are already consistent with marginal year-on-year falls in official production figures, and point to a sector struggling to contribute meaningfully to overall economic growth. 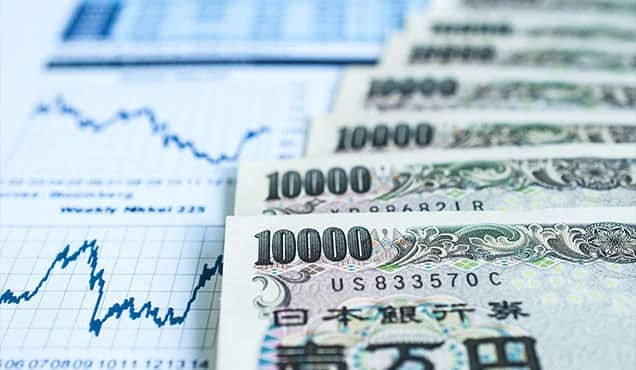 An additional concern is that price indicators suggest input cost inflation is reaccelerating in the manufacturing sector, especially for intermediate goods, where input prices rose in June to the greatest degree for 16 months. Alongside fuel and energy, metals (steel especially) are widely reported to have risen in price as the inflationary effects of tariff increases make their way through supply chains. Such inflationary pressures are spilling over to parts of the service sector, where operating expenses are rising to the greatest extent in two years. 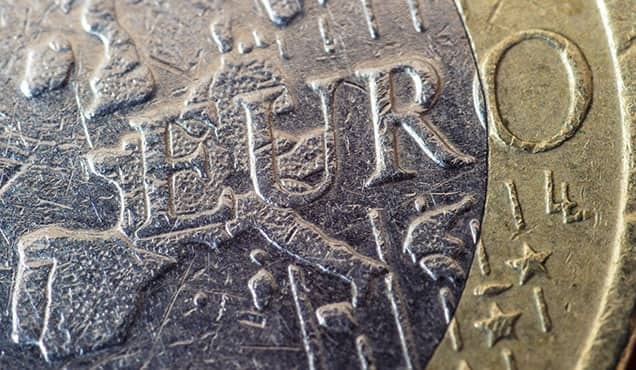 Companies are so far generally resisting the urge to pass on these higher costs to clients, with charges falling again on average in June, but there is nonetheless concern of wider consumer price inflation maintaining its recent upward trend in the coming months as prior cost increases feed through.